Driving the latest Audi A4 is no hardship at all! Sitting right at the top of the class, both the Audi A4 Sedan and the Audi A4 Avant are exceptional drives. It all starts with an exterior design that is one of the more beautiful automobile creations on the road. A blend of sportiness and curves create a mix that appeals to the heart and draws admiration. Excellent drive trains and engines make for a classy drive that boasts a balanced handling package and decent power when required. The bigger A4 engines are seriously quick, while the smaller engines are some of the most efficient. Looking for a classy mid-sized motorcar? Drive an Audi A4, and I’m sure that you will be more than a little impressed! When I was a child, station wagons were what large families always drove. They were big, messy and somewhat tinny, with the back crammed with grocery bags, hairy dogs and the occasional extra passenger riding illegally. It was, therefore, a very pleasant surprise to see the new Audi A4 Avant station wagon. 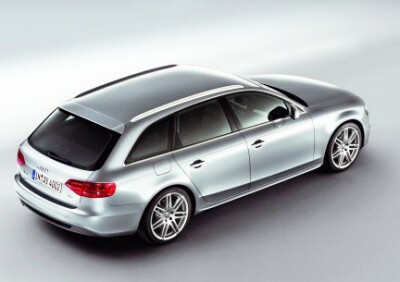 All the old stereotypes have been blown away: the Audi A4 estate is a beautiful machine that has not only the practical advantages of the old station wagons, but also supplies the class and elegance that was so often missing. Not that the Audi A4 Avant is the only A4 on the road. This mid-sized family vehicle with class offers the prospective buyer a huge choice of models in both estate and sedan form. There are four petrol versions (a 1.8L turbo, a 2.0L turbo and a 3.2L V6) and three turbo diesel engines (2.0L, 2.7L and 3.0L). The new Audi A4 is a superb next-generation design and has that mmm-mmm factor of sportiness and luxury. Not only that, but the US-based Insurance Institute for Highway Safety rated the 2008 Audi A4 as its top safety pick. When it comes to power, the base 2.0 litre four cylinder is the “lightest” of the Audi A4 engines, producing 96 kW at 5700 rpm, while the 2.0 TFSI Quattro S line can produce 147 kW of power at 5100-6000 rpm. The 1.8 T, while it has the smallest engine capacity in the Audi A4 range, produces 120 kW at 5700 rpm which helps it accelerate from 0-100 kph in 8.6 seconds, not too far behind the 2.0 TFSI Quattro S variants which will pull in the 0-100 km/h time at around 7.5 seconds (the standard 2.0, by the way, goes from 0-100 kph in around 10 seconds). The top of the range model has a very quick and refined unit under the classy bonnet lines. The 3.2 litre V6 has a very respectable195 kW output at 6500 rpm. Figures like this ensure a very Smart 0-100 km/h of 6.4 seconds. The 3.2L V6 is linked to a six speed automatic. You will find a drive to suit your tastes, especially as the Audi A4 range has a CVT, a five and six speed manual, and a six speed automatic on offer. But, let’s not forget the diesel options. All are smooth and willing performers, capable of quick acceleration and effortless cruising. The best option remains your preferred choice. It is pleasing to notice that all versions of the Audi A4 we reviewed have the same safety features as standard – the only “safety” feature unique to the 2.0 TFSI Quattro, the 3.0 TDI Quattro and the 3.2 FSI Quattro is the all-wheel drive indicated by the version name (the rest are well balanced front wheel drive vehicles). Audi’s specially designed backguard system is in place in all versions of the Audi A4; this is where the seats are designed to hold the upper body in place and support the head if some outrageous idiot rear-ends you. The servotronic speed sensitive steering will help you manoeuvre the Audi A4 out of a dangerous situation, and the ABS braking with ESP, EDL, anti slip regulation and brake assist will help you stop short of an accident. But if the worst occurs, the driver and passenger side airbags (which have a two-stage inflation depending on the seriousness of the crash), the side airbags at front and rear, and the head airbag curtain at front and back will all come into play, ensuring that you and your up to four passengers stay safe. Safety is further enhanced by the pretensioner seatbelts with force limiters in the front, and the impact-absorbing side impact beams that are integrated into the front and rear doors. The Audi A4 does come with a standard first aid kit and warning triangle, just in case. On the lighter side, the Audi A4 will leave you well catered for. Driver and passengers alike will appreciate the MP3 compatible CD player and sound system – complete with ten speakers and 150 watt output. The Volterra leather upholstery is beautifully set off by aluminium facette silver trim, which can be upgraded to optional burr walnut or birch. The automatic dual-climate control air conditioning with sun sensor and pollen filter is also provided to make a drive in the Audi A4 the best it can be, and with heated front seats, power windows with pinch protection, and some very beautiful walnut trim in the interior, of course it will be! Is the Audi A4 Avant wagon a family car? Certainly, all members of the family are bound to enjoy riding in its capacious interior. But the Audi A4 is a well-mannered and elegant car, and it would probably pay to make sure the occupants match the vehicle. We hope you enjoyed this Audi A4 review! For any more information on the Audi A4 , or for that matter any other new car, contact one of our friendly consultants on 1300 303 181. If you’d like some fleet discount pricing (yes even for private buyers! ), we can submit vehicle quote requests out to our national network of Audi dealers and come back with pricing within 24 hours. Private Fleet – car buying made easy!